Soap and Glory | I love nice things! 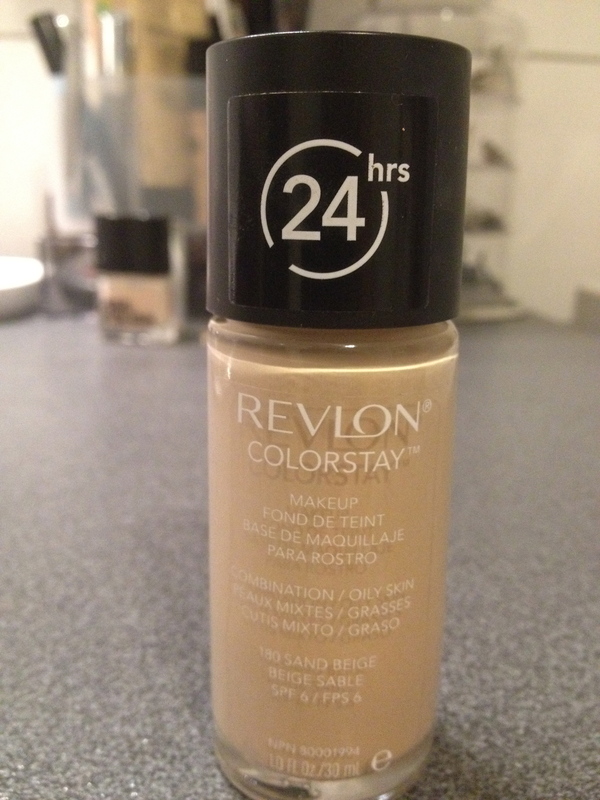 I had heard so many great things about Revlon Colorstay Foundation on You Tube, so when I saw it in London I thought I`d give it a go. I don`t normally wear foundation these days, and most certainly not in the summer, but hey. I got mine in the shade 180 Sand Beige, and it`s the one for combination/ oily skin. The shade is a bit light for me at the moment, as the sun made a guest appearance last weekend, but I`ll save this foundation for darker times I guess… I`m super happy with the coverage, but that may just be me not being used to something that covers more than a BB cream and tinted moisturizers. But I do like it! I have only tried it on once, but I`m a fan. Sadly I don`t think we have Revlon in Norway, otherwise I would try to find it in a darker shade as well. I got two perfumes at Gatwick on my way home. 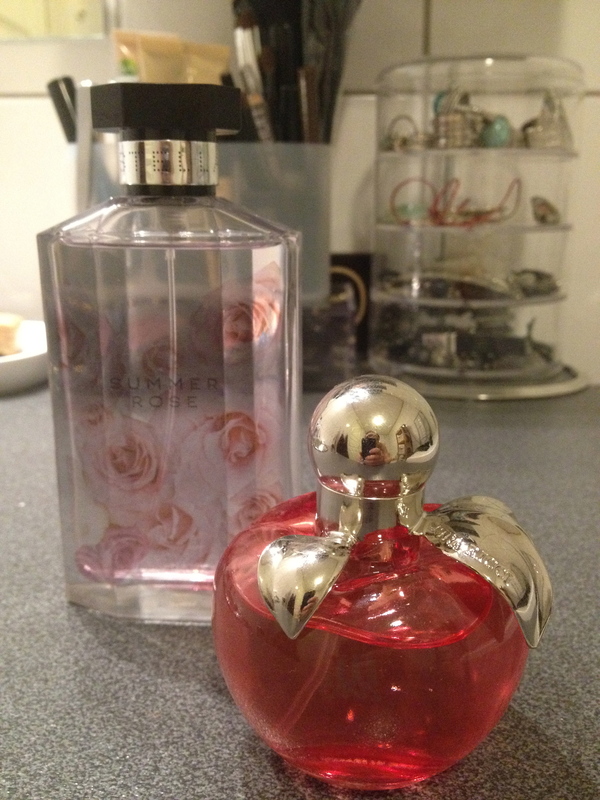 One is the Stella McCartney Summer Rose, which we don`t have here as far as I know… (That seems to be the theme of this haul.) It`s lovely, fresh, floral and light, and I love it! It`s not a scent that lasts very long, but I can live with that. It`s yummy! The other perfume is my third bottle of the same one. Nina by Nina Ricci. This is also a floral, young perfume, but I find this lasts a bit longer, and is a bit stronger smelling. I think this will be one I`ll keep buying for many years. Loves it. 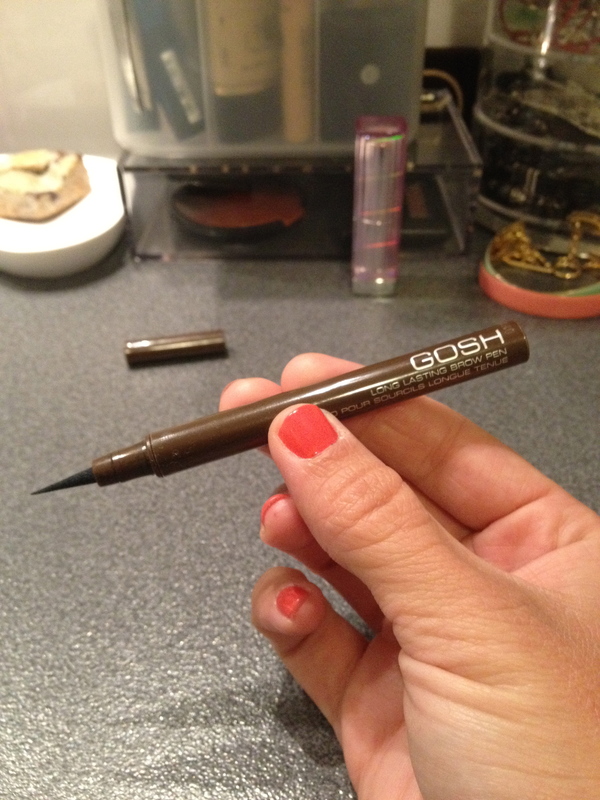 This is the Gosh long-lasting brow pen in the color Wheat. 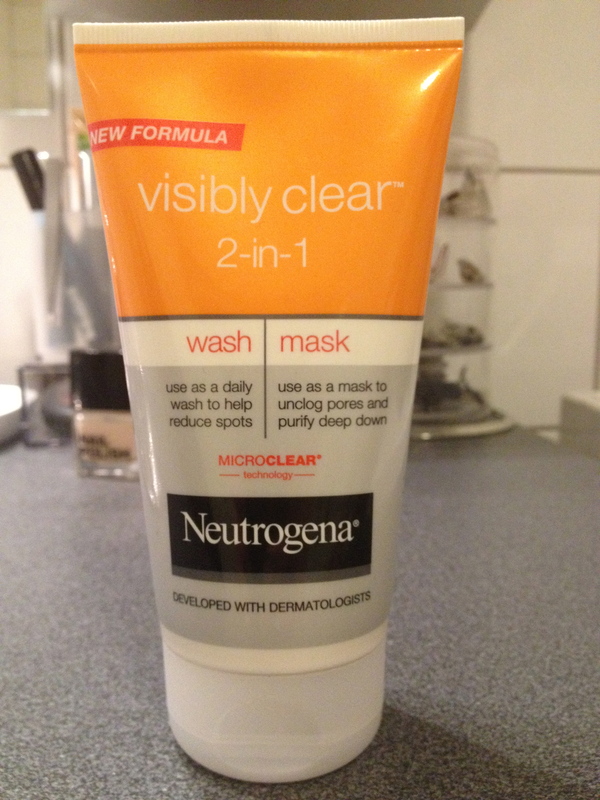 I saw this in Essiebutton`s browvideo on YouTube, and wanted to try it for myself. I think it`s great, and cool toned enough for me. I`ve never used anything like this for my brows, I´ve used brow pens and brown eyeshadows really… But now I`m converted. I think this is a great product, that is if you find the right shade. I know I´ve seen Gosh in Norway, so there`s actually a chance I`ll find this again when it runs out! So, that`s it for now. I have bought a few more things since we got back, so there just might be another haul post coming up soon(ish). Hope you like it. I haven`t really included anything other than makeup and skincare, but maybe I`ll do that the next time. 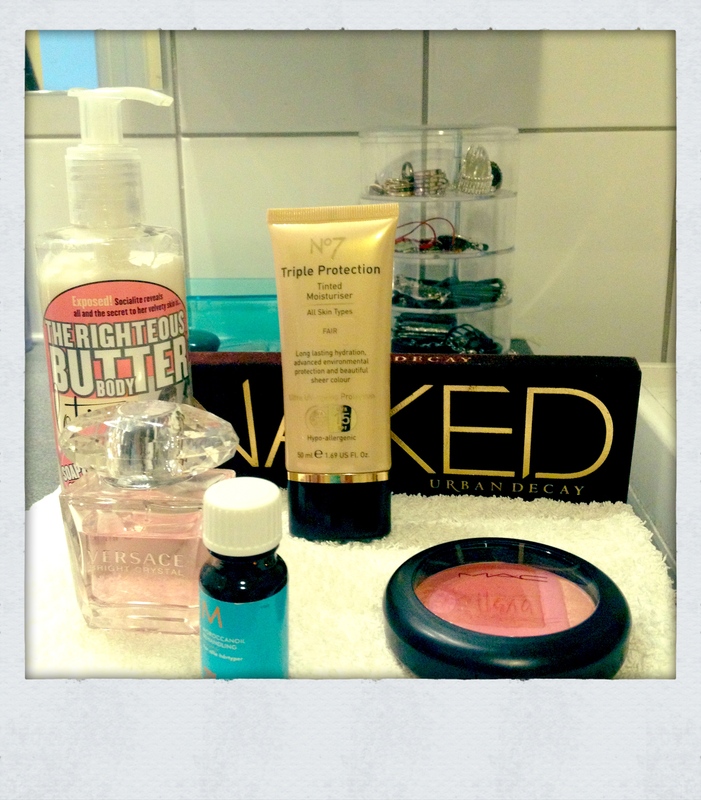 The first thing I`ll do, is write about my march favourites! I love to watch beautyvideos on You Tube, and especially monthly favorites. I`m a bit late, but better late than never, ey? The first thing I really like is The Righteous Butter body lotion from Soap and Glory. I LOVE this lotion! It smells like a piece of heaven, and is perfect in all ways. There is also a body butter if you prefer that, and it smells the same. I got mine at Boots. I have also really enjoyed the Versace Bright Crystal sent. It is a very floral scent, and is perfect for spring. The only thing is that it does not last very long on the skin. I have also been loving my Urban Decay Naked Palette. It is the perfect neutral palette, with great shimmery colors. The only negative is that there are only two matte colors. But the great quality of the eyeshadows makes up for it. I got mine at Beautybay.com. No.7 Triple protection tinted moisturizer, spf 15 in the color fair has also become a good friend in march. It`s light, not greasy, and does not break my skin out. It`s also affordable. What more can a girl ask for? I got this at Boots. Finally, it`s my MAC Vera Pearlmatte Face Powder in the shade Flower fantasy. It`s perfect for everyday use, and it also has some shimmer that you can choose to include or stay away from. I have used this as my blush every day since I got it, and since it is a limited edition powder I may be getting a backup of this one. Just in case I never find something like this again.